1. Maisy's Christmas Day - We're big fans of Maisy Mouse starting at about 15 months on up around here. The bright, bold artistic flair that Lucy Cousins gives to this little mouse are quite attractive to the eye. 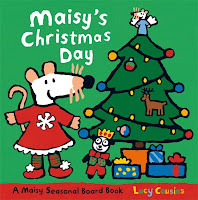 The different animals who come to celebrate Christmas Day with Maisy are enjoyable to read about. This is a board book and a simply told story that we've read over and over again. Cute, short and colorful. 2. I know that there are a multitude of version of the 12 Days of Christmas out there (and we have several!) 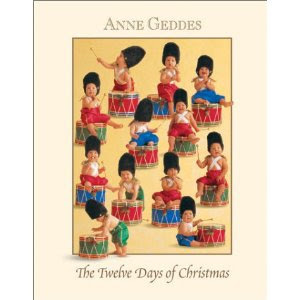 but for some reason our favorite is Anne Gedde's Twelve Days of Christmas . It's now out of print, but I managed to find and pick up a copy last year. Let me tell ya, we've spent a whole lot time looking through the pictures of the babies dressed up in 12 Days gear. Something about the babies draws the little ones in, I guess! Another version you might want to check out is The Twelve Days of Christmas (Read & Sing Along) by Twin Sisters which, as you might guess, has an accompanying CD with various songs on it. Naturally the 12 Days of Christmas is one of the songs included on the CD to help a parent out! 3. 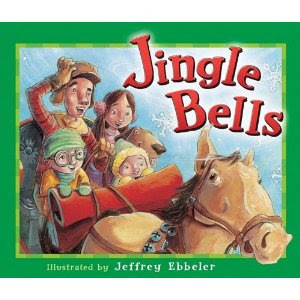 One of my personal favorites is A Magical Christmas and is a Tiger Tales book. This one is marked for ages 3-7 and I think that's just about right. 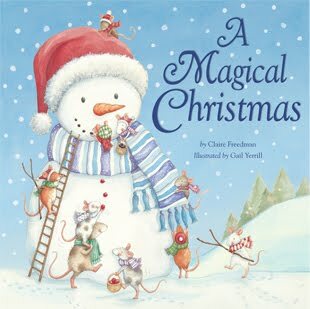 I think it's perfect for toddlers though because the story is simple, talking about what makes Christmas so very magical. The illustrations by Gail Yerrill involve the use of glitter on each page, making the pictures of the mice just come to life in a bright and sparkly way. The pages of this book are printed on heavy cardstock and is very durable, holding up well to the little hands who will absolutely want to touch and finger each page! 4. What toddler that you know doesn't like to sing? Some of our hands-down absolutely favorite Christmas reads are ones that involve some of our favorite Christmas songs! Our top two favorites (that we've already begun singing this year!) are Jingle Bells and Frosty the Snowman . Both of these are board books which is a good thing because if you decide to pick them up you should expect to make frequent use of them! We do anyway. 5. For some more fun and games you might want to check out I Spy Little Christmas which is marked for babies through preschool. This one is fun to pull out once a year and encourages the little ones to hunt for various Christmas items hidden within the bigger picture. 6. Have a Thomas fan who is willing to sit through a Thomas story? Both of my boys like this one! Thomas's Christmas Delivery! CAN Thomas make it through the snow in time to deliver a young boy his gift in time for Christmas!? Will he be a really useful engine!? It's anyone's guess (but make your guess a good one!) This is a "sparkle" book as well so it has added draw. 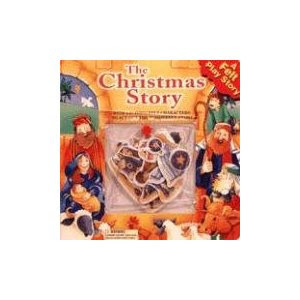 #7 - The Christmas Story provides more hands-on fun as it is a a felt play story. As you can see from the picture here, the felt pieces of key characters and animals from the nativity story are included in a front clear pouch with a button on it to keep the felt pieces safe. I would say adult supervision is handy with this one, but it also provides another way to interact with kids as they are learning the Christmas story. The text is limited in this book but you can piece together the goings-on in either your own words or with the provided felt pieces. There is a lot of excitement when we pull this book out as well! #8 - The Small One is one that I have talked about before. This particular book is (very unfortunately!!!) out of print but if you can snag yourself a copy - DO! The text is rather long but that has not dissuaded my then three and now four year old from the story. He connected with the character of Small One (the donkey who ultimately provides a ride for Mary) immediately and whenever he hears the Christmas story, he assumes that any donkey positioned near any stable is Small One. This is a GREAT tale and a fun one to read! 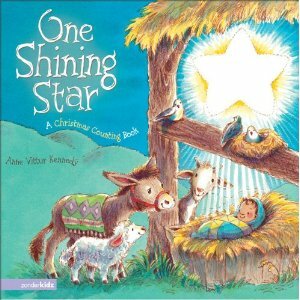 #9 - One Shining Star: A Christmas Counting Book is listed as being fit for ages 4-8 but I honestly can't see how any child past the age of 4 or 5 is going to be all that interested in it. It's great for new toddlers and I would probably max it out at 4. This one tells the Christmas story by counting the various things you would find in the "stable." 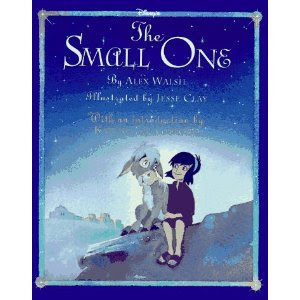 The star is shiny in the book and the illustrations are definitely noteworthy - being soft and gentle. We have definitely enjoyed this book but I think Bookworm1 (age 4) is nearing the end of it. #10 -Lastly, Tiny Baby Jesus is also marked for ages 4-8 but I would put it in the 3-4 year old category. I like this one in particular because the story flip flops back and forth between Jesus the baby and Jesus the man, helping the young reader to connect the dots between the baby born in the manger and the one who died on the cross. 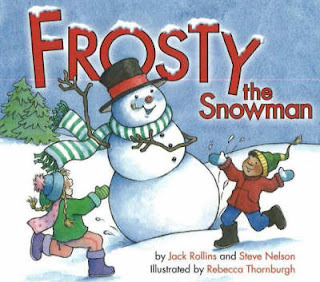 I've never seen another book quite like this one and I'm a pretty big fan of it's unique approach to telling the Christmas story and assuming that the little ones can make the connection. Do you have some titles you would recommend? Do leave a comment below! 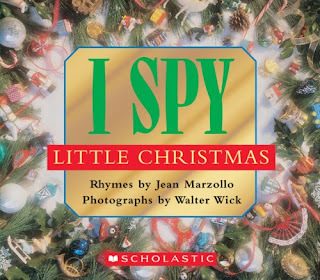 I'm always looking for fun new books to add to our holiday collection and I know others are also. Have you written up a post on this topic? Leave a link and I'll go and visit! In the meantime, Merry Christmas to you! I can't remember any books that I totally loved, but I agree about the Little People nativity-an awesome tool to teach about Jesus' birth. 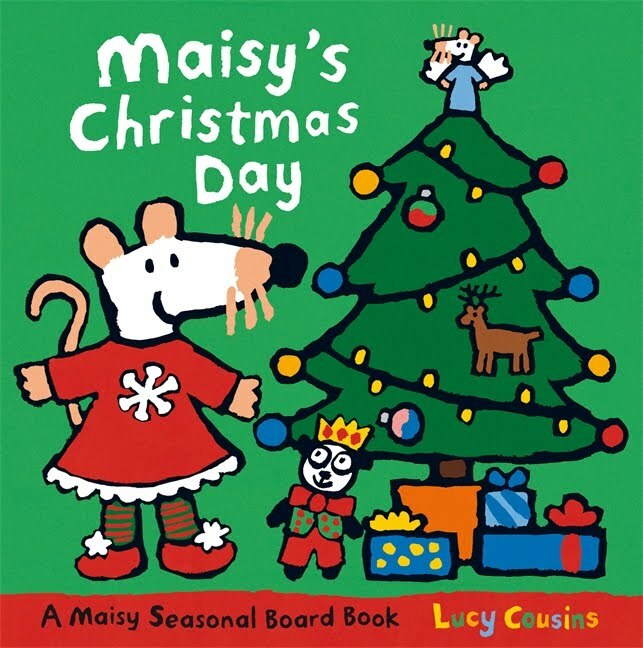 M saw your post and immediately said, "I want that Maisy book." 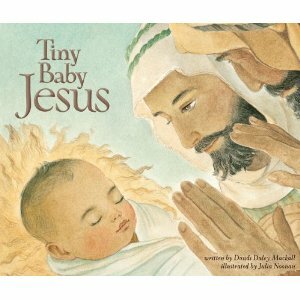 Tiny Baby Jesus does sound like an excellent book. I got them out because I plan on implementing Amy's (@ Hope is in the Word) idea of wrapping the books in Christmas paper and letting the kids each open a book a day to spread the fun out a bit. So I was sorting through the stack and marking which titles I wanted to read which day. Now, to wrap! Thanks! We'll be checking out these books. We have one called Little Lamb's Christmas that a friend gave me when Cory was born. It's a "board book", but really it's just a full size book made of cardboard. It's nice and the story is short, but accurate. It's fun to find the star on every page and the illustrations are simple and relevant.